Av. Brasil 2147 – Valparaíso – Chile. Our ability to precisely locate where a sound comes from is due to many factors, noteably that we have two ears and our brains can use the geometry of our head and ears to distinguish originating direction. The fact we hear with two ears is called binaural hearing. It has been a matter of study and research for many years and has many technological applications. Among the outstanding applications are: 3D sound reproduction and recording systems, architectural acoustic designs, sound design, individualized adjustments of orthopedic hearing aids, teleconferencing systems, among others. Hardware equipment called dummy heads allow us to study this topic  . They are available purchase and at some research institutions and consist of a real-sized artificial head, including two ears that have microphones in the ear channels. With a dummy head, it is possible to record sound exactly as if it were on our own ears. This has led to the production of some of the amazing 3D recording available for computer games, videos, and other music production. These dummy heads are also used intensively for research purposes. There is an ITU (International Telecommunications Union) standard for dummy heads, but it is hardly sufficient to fully model individual heads, likely representing only average head dimensions, or median sizes. 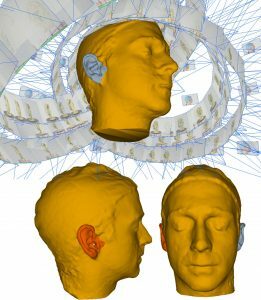 My individual head is different to a dummy head and these differences, in size and geometry, can affect how good or accurate the results of auditory measurements can be. The innovation of our research is in the development of a methodology constructing individual 3D computer models (CAD) of heads and ears, including the outer part of the ear, called the pinna. The results of these three-dimensional models can be used to directly compute individual acoustics parameters on a computer or to build an individual dummy head. The methodology to obtain the 3D CAD models has to steps: i) the model of the head and ii) the 3D replicas of the ear. Photogrammetry is a method used to get 3-D information from a set of pictures taken of the object of interest, such as a head. 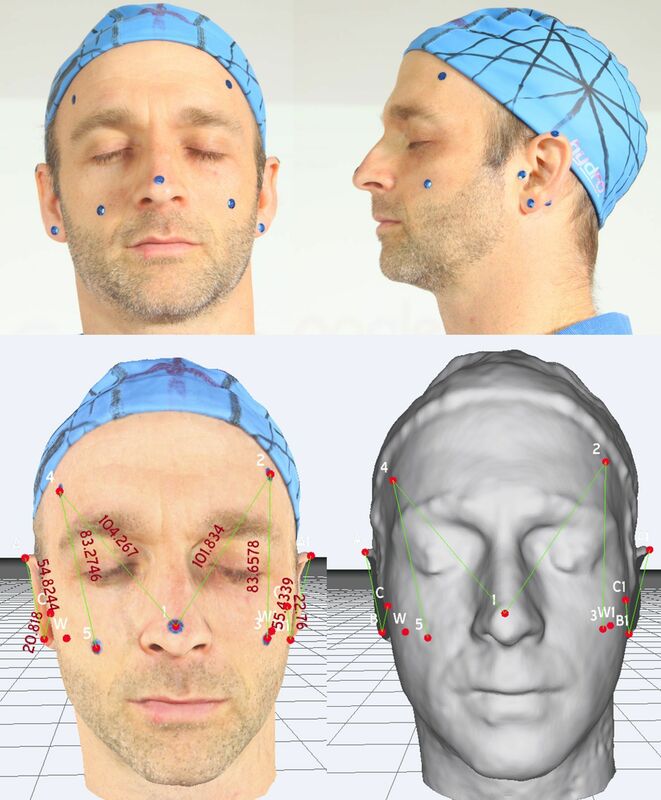 If we want a high resolution and high precision model of the head, we need many pictures, from different angles and positions, to cover the head fully. We use the processing software 3D Zephy, but there other options exist. Finally, we obtain a 3D CAD model which also includes the color and texture of the object, but only the geometry is of interest for acoustics. The form and geometry of the pinna makes it almost impossible to get an accurate 3D CAD model from a pure photogrammetry method. Therefore, we used a molding process  . First an alginate negative is created and then a plaster positive. Most of the plaster pinnae are cut, to open and show the concavities (Figure 2). The plaster models of the pinna can be converted in a 3D CAD model using photogrammetry again or by means of a 3D scanner. We used the latter, and the result is shown in Figure 3. 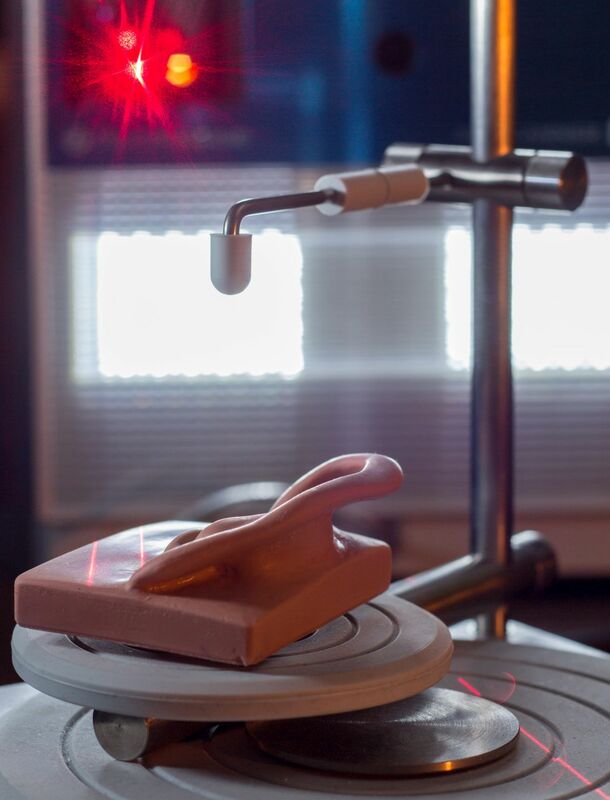 This method uses a combination of laser and imaging on a small rotating platform. We tested and compared the results of each one of these processes (e.g. See control points and distances on the participants and on the CAD model in Figure 1). To check how robust the methods are, we also performed additional quality tests: We used more or fewer pictures in the photogrammetry software, photo-sessions for the same participant were repeated on different days, etc. The results of these comparison showed us that the mean error was lower than 1.5%. 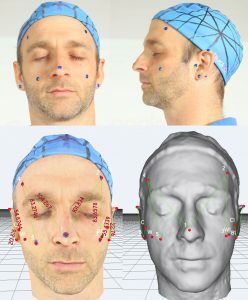 Finally, the partial results, consisting of one CAD model of the head and two CAD pinnae, were joined to form one 3D CAD model (Figure 4) that will be used to compute the acoustic cues for that specific person (this is called the Head Related Transfer Function, HRTF). We will compare our results in its quality with 3D audio localization listening test with that same participant. This will finally give information about how good this hybrid process is for obtaining individualized dummy heads. D. Batteau, «The role of the Pinna in Human Localization,» Proceeding of The Royal Society Biological Sciences, vol. 168, pp. 158-180, 1967. J. S. Rayleigh, The Theory of Sound, London: Macmillan, 1877. K. Martin y G. Bill, «HRTF Measurements of a KEMAR Dummy-Head Microphone,» MIT Media Lab, Massachuset, 1994. F. Wightman y D. Kistler, «Headphone simulation of free-field listening. I: Stimulus synthesis,» The Journal of the Acoustical Society of America, vol. 85, nº 2, p. 858, 1998. J. L. Bravo , «Construcción de Modelo de Oreja Artificial de Silicona y Medición de Características Acústicas,» Valparaíso, 2015. R. Codoceo, «Construcción de Modelos 3D de Oreja y Cabeza Individualizada para Medición Acústica,» Valparaíso, 2016.